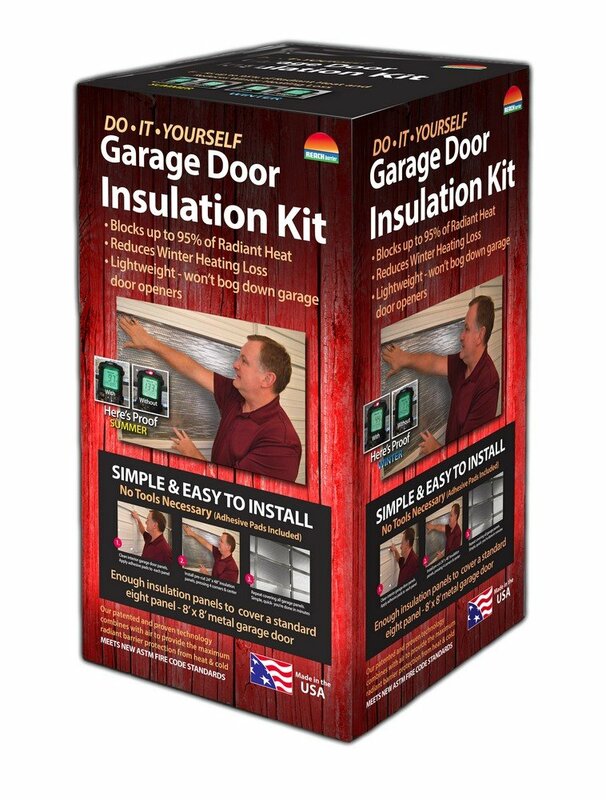 Best Garage Door Insulation Kit Reviews: Top-8 in April 2019! Which Garage Door Insulation Kit is The Best? In this article, I take a comprehensive look at garage insulation. What I present to you are 10 of the best garage door panel insulation kit options, a frequently asked question section that explains a bit more about garage insulation and then a comparison between some garage insulating kits and materials. A few things to know before I start. The best garage door insulation for hot climates is not the same as those for cold climates so that some solutions might be better for hotter climates and others for colder ones. With that said, the best garage door insulation material is always considered based on its R-value, which I explain in the FAQ. 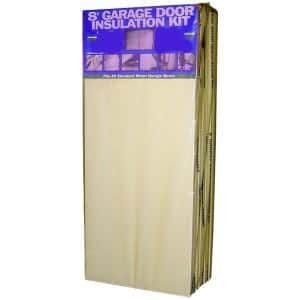 There are many different garage sizes, so when you decide to seek the best 16-foot garage door insulation kit, consider that it will contain the same materials as the best 9×7 garage door insulation kit but for a different sized door panel. If you intend to insulate without a kit, buy more insulation material than you need. Sometimes when cutting to shape mistakes are made, and you don’t want to be left with less material. Some kits come with pre-cut plates, always make sure these are just over the size of your garage door frames, and always make sure you buy the kit that fits your overall garage door dimensions. 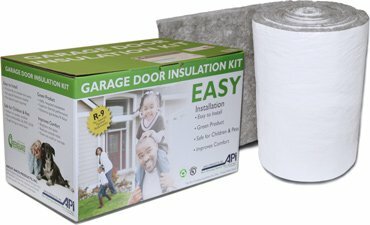 How To Choose A Garage Door Insulation Kit? 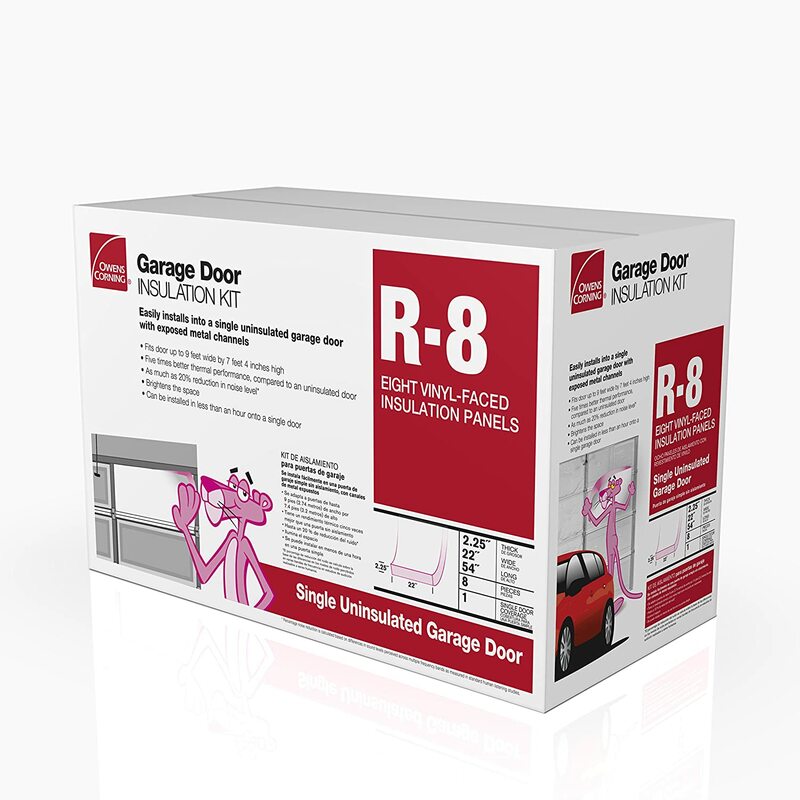 Owens Corning’s Garage Door Insulation Kit is made of R-8 fiberglass insulation panels with a tough, washable white vinyl facing. The kit comes with all the components to make and secure a quick insulation solution to your garage door. It is made of a standard fiberglass panel that has an R-value of 8 and includes all the panels and hardware to fit into a standard garage door very quickly. Owens Corning is one of the more popular brands on the market, and they provide a plethora of options when buying their insulation kits. This model installs in under an hour, and the vinyl surface is easy to clean, it also comes with a 20 percent reduction in noise performance. The Matador® Garage Door Insulation kit uses EPS foam insulation panels with an R-value of 4.8. Matador is a well-known brand and a leading supplier of insulation materials across the USA. This Matador garage door kit is a straightforward kit to use and comes with all the panels and hardware required to install their EPS foam panels into all 8′ and 9′ doors; there are also kits for 16′ and 18′ doors too. This is a comprehensive kit that comes with all the hardware for a fast installation within one hour. The Matador model also reduces sound levels and has a bright white easily washable surface. The Reach Barrier 3122 Silvertanium Garage Door Insulation Kit uses recycled thin barrier that you cut to specific dimensions. This kit is for insulating an 8’ x 8’ garage door. Reach barrier is an innovative hi-tech company that has designed and perfects ultra-thin insulation materials used for handling heat and cold. Their solutions do not look like any other, and this is because they took the hi-tech route rather than the standard route. The Reach Barrier 3122 model is pre-cut, which is sometimes OK, but in most cases not. Unless you prefer to take a chance and just fit in the paneling as it is. The kit is light and easy to use and comes with eight pre-cut panels that are 24″ by 48″ each. Each kit comes with 48 REACH Stick’ems™ which are High-density, open-cell polyurethane foam squares 1/8″ that adhere the panels to the garage door securely using a longer-lasting acrylic adhesive on both sides. This is one of the few hi-tech insulation barriers on the market, but as yet, is not considered to be a viable solution for the extreme colds of the North, it is an exceptional heat barrier for the hotter climates. Insulfoam’s Garage Door Insulation Kit is an engineered EPS sheet of insulation that comes with no formaldehyde or ozone-depleting HCFCs. This kit gives you an R-value of 5.2 at 40oF and 4.8 at 75oF; eight pre-cut panels are 201/4″ in width and 54″ in length. The plates are all 11/4″ thick. 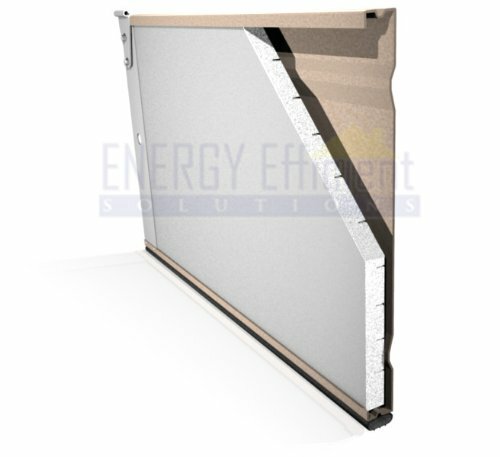 These are very easy panels to attach and provide an essential insulation performance. Insulfoam is found online and is a perfect garage door solution for both hot and cold. This product is super easy to install, and an average standard garage door will take about 30 minutes of your time. Anco produces a high-grade insulation kit that has an R-value of 9. When it comes to a more comprehensive solution, you would want to choose the Anco kit that uses 2″ thick panels for a 9′ wide garage door. This kit comes with all the plates and hardware for easy installation, and the R9 value is of extreme importance when compared to other models. Anco is made of a mixture of fiberglass and polymer materials with a 2-inch thickness. This is one heck of an insulation package, and when compared to the others in price-performance ratio, the R=9 value is just too high to ignore. As such, when it comes to total ready to install solutions, this is the one to get if you want extra strong protection from both the cold of winter and the heat of summer. 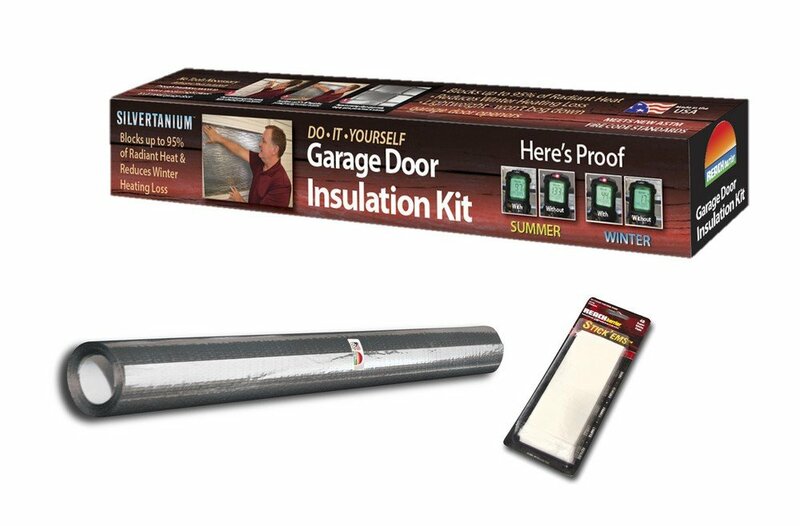 The ADO Products Garage Door Insulation Kit is made of vinyl covered R8 fiberglass insulation. 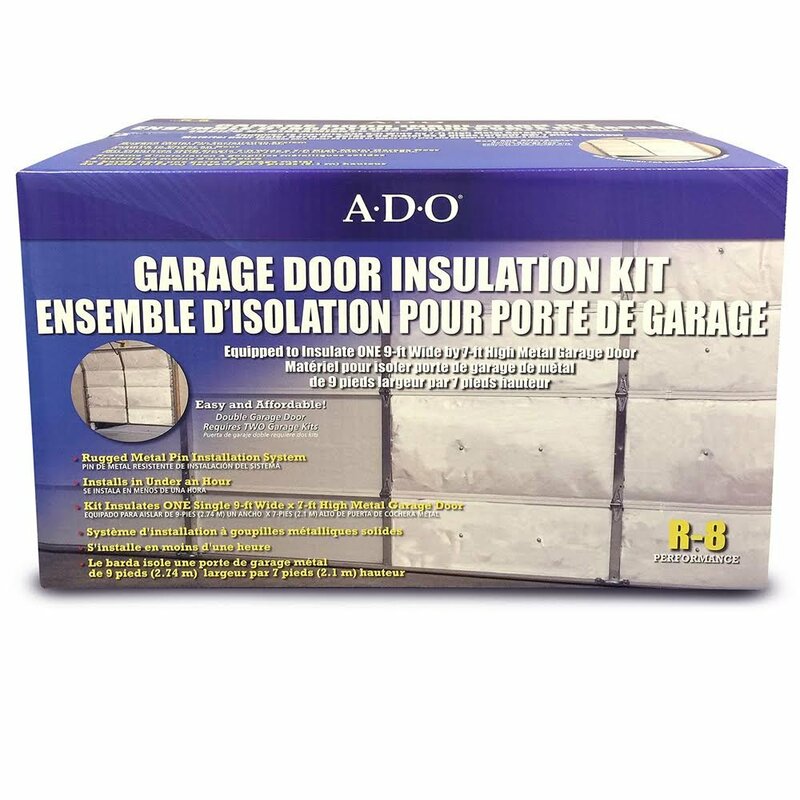 The Ado is an R-value 8 Single Garage Door Insulation Kit that comes with a Rugged Metal Pin Installation System that doesn’t break during installation and installs in less than an hour. This product comes with a bright white cover to keep the inside light and clean. The kit is made up of a roll of vinyl faced insulation that is 22″ x 37″ and has 18 retainer pins and caps. The ADO insulation kit is a standard kit competing for its place in this crowded category. It is an excellent example of average, giving you an R-value of 8 with fast installation, a sound damping effect too and a clean and easy to clean white surface. This is the Reach Barrier Reflective Air² insulation with Sound Reduction Technology™. 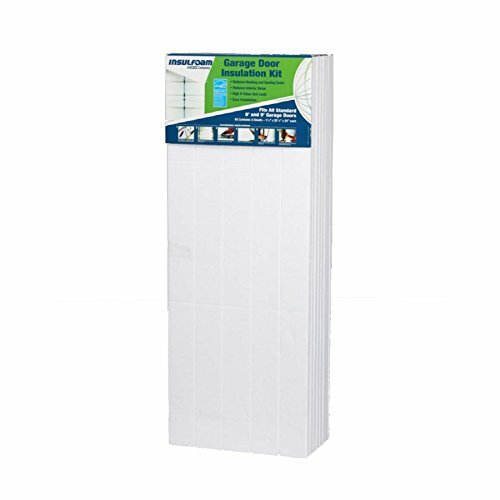 The Reach Barrier Reflective Air² comes with eight pre-cut panels of high-density, open-cell polyurethane foam squares 1/8″ thick. The panel sizes are around 24″ x 48″ each, and they come with REACH Stick’ems™ that have acrylic adhesive on both sides, and the R-value is around 4.8. This is another thin insulation solution for hot climates, and the 3009 comes with precut sheets saving you time to cut and prepare for application. To be honest, at first I was not a fan of this product, I said it’s too thin, WTF!? However, then my eldest son gave me his North Face winter jacket that weighed less than my wallet, and I used it instead of my heavy army camo jacket, and guess what…WTF!? Why didn’t I have one of these in Syria on the Golan Height area, this is one heck of a warm jacket. So, guess what, this is not a sign of anything except that its thinner and takes up less space. When I tested it for temperature changes, it showed off its true colors, and that’s why I am writing more about this then I am about the others. 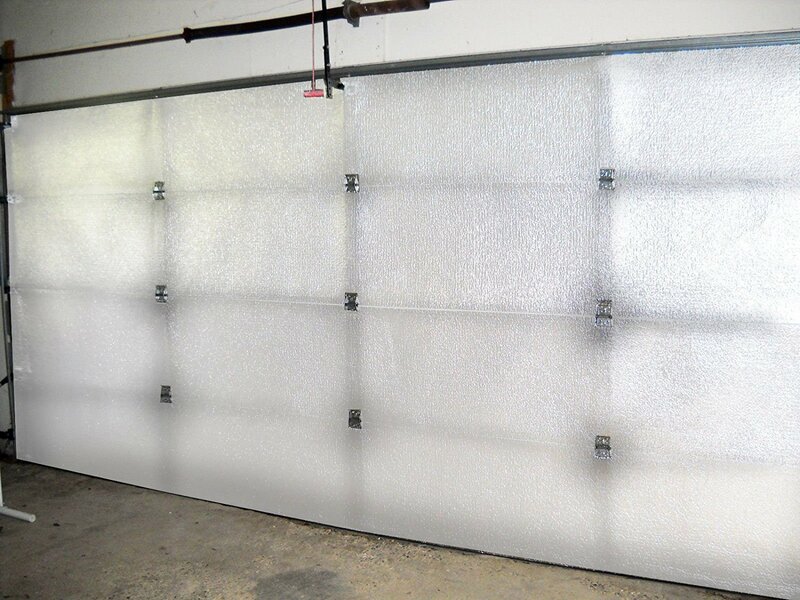 Bottom line, the Reach Barrier is a perfect solution for garage insulation, and since its so thin, if you want to pad it up with standard EPS Foam, go ahead. This is the Battic garage door kit for two car garages. It comes with an R-value of 6. The Battic all-in-one kit acts as both heat and sound barrier. This kit is made up of 4 rolls of reflective insulation, where each roll is 2′ by 18′ accompanied by a roll of double-sided tape, a tape measure, and a disposable knife. You also get alcohol swabs that are used to clean your garage door surface before application. The Battic is a no-nonsense kit and also suppresses sound too. The silver kit gives you a ripple silver finish that seems a bit too industrial for my liking, but the white was perfect. The material consists of two layers of polyethylene bubble film sandwiched between two layers of metalized film. This is Cellofoam’s easy to install, universal metal garage door insulation kit made from Expanded Polystyrene (EPS) foam core is. Cellofoam’s garage door insulation kit is an EPS foam kit with an R-value of 4.5. This kit comes with panels that have a High Impact Styrene (HIPS) laminate coating that provides an easier cleanable surface. The material is fire resistant, made in the USA and is Energy Efficient EPS that has kerfing for quick and easy installation along strategic distribution points. The overall effect is a reduced heat and sound performance. The Nasa Tech garage door kit sandwiches a foam core laminated between White Vinyl finish on one side and a reflective finish on the other. There are four panels in this kit and has an R-value of 8. What stands out with this kit are its other features that include puncture resistant properties of up to 60 lbs., per inch, and a fire rating of E84-08. This kit comes with all the hardware for a fast installation. This product is not like most insulation materials you come across, in fact, it’s more of a heat reflector than a heat insulator. As such, it looks and applies differently than other products. The manufacturer states that the best way to insulate with this product is to leave a gap between the frame face and the material, creating an insulation pocket. Sounds good to me, tried it out, and yes it works. There is a lot of insulation material floating around in the marketplace, however, each insulation material has a different design and structure focusing it to a specific purpose. Garage doors are a bespoke purpose but come in standard sizes, so there are plenty of ready to install kits that vie for your cash. No matter which solution you decide to go for, a garage insulation kit or just buying insulation material to insulate a garage door, consider the insulation material types you will encounter. Fiberglass is the most common insulation material on the market. It is easy to fabricate, easy to shape into sheets, rolls, and free buds. It is used in all home and commercial applications and is used for garage doors too. The average R-value of Fiberglass garage door panels is 8, but the actual R-value of fiberglass is only 3.1-4.3. Cellulose is loose-fill insulation which has started to take the insulation field by storm. However, with all its great cost-efficient and green effectivity, Cellulose has a good R-value of around 3 to 3.8. The functional aspects of cellulose are that this material is usually made from recycled fire retardant composites, such as a treated newspaper. Cellulose is usually loos filled, but it is starting to appear in some garage door solutions too. Rigid foam is another very popular garage door insulation material. This material is usually made from EPS which is expanded polystyrene (similar to Styrofoam), or as extruded polystyrene, and polyisocyanurate. Dependent on the material type, rigid foam R-value is high, ranging from 5.5 to 8 and as such, is considered to be an inexpensive yet viable solution specially designed for garage doors. Many kits are made of EPS foam plates precut to the exact dimensions of most standard door panels. Before you do buy an EPS kit, check to see it is fire retardant. Spray foam is another excellent R-value solution for air-sealing. However, this is a high-end solution for wide area applications, and using it on a garage door is extreme, even if you have a big garage door. The issue of application is covering it after it is sprayed. This is, however, the best solution (competing with thick fiberglass) when converting your garage into a living space. Insulating a garage door is not a complicated business if you have around an hour to spare, you can finish an average door in that time. All you need are the insulation panels, a measuring tape, a box cutter knife and your set to go. There are two options, buying a kit that comes for specific door frames, or accurately measuring the panels in your door, and buying the insulation panels to cut and install. If you DIY without a kit, then your first step is to measure the door panels accurately, and then cut the panels out of the sheet of insulation, but make sure they are a total of 1 inch longer for the vertical measurement, this will assure that when you place the material in the frame it will bend slightly. This is a critical issue since it creates an air pocket that enhances and enables the insulation to work at optimum performance. This air gap is primarily used to reduce the heat entering on hot summer days. It also improves the overall insulation properties in winter too. Make sure you measure all the panels, some can be different due to manufacturing processes. In other words, don’t rely on that one-panel size fits them all. Once you have cut all the pieces to shape, take the foil side facing the door and insert the panel, slightly bending it in, the frame on the door as a slight ridge, so insertion will result only when applying force, and you hear that pop sound. The panel will have a slight concave look, like a bubble. That’s about it, nothing much more to do. If you get a kit, make sure you buy the kit that fits your garage in size, in other words, you will need to cut the insulation, but make sure there is enough insulation to cut. Other issues with insulating a garage door are this; don’t insulate a garage door if the rest of the garage is not insulated. Certainly, you will have covered the main concern, where a garage door is a large surface exposed to the elements, and has wide gaping holes in the sides, at the top and bottom. However, consider the roof too, it is just as large as the door if not larger and if the roof is not insulated you are plugging up one area while leaving the gaping holes in another. Weather-sealing a garage door is a simple process, and there are many options to choose from. Remember, a garage door has four sides, so you need to prepare four seals, and take into account that the floor is flush with the outside, so you need to prepare more than one seal for the floor. A bottom seal will usually come in the form of a long strip of rubber or vinyl that you attach to the bottom edge of the garage door. Since it brushes against the floor on a daily routine, over time it will wear away, so always check to see if there is any sunlight passing through the gap that is the sign to replace the bottom seal. For wood doors, use a simple strip-style seal with angled edges and attach them with galvanized or aluminum roofing nails. 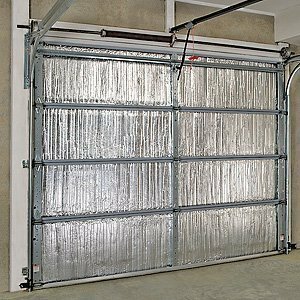 Metal garage doors have an aluminum channel on the bottom that holds a U-shaped rubber gasket. The gasket simply slides into two small tracks on the channel for installation. U-shaped gaskets come in different sizes to seal gaps of various heights which is an advantage for large gaps formed by sunken or cracked garage floors. The next seal to consider is the Garage Door Threshold Seal. This is also a bottom seal, but attaches to the floor and not the door. You will want one of these too since this is used to keep rainwater from flooding into the garage. You can also use one of these as a cracked or deformed floor seal. These seals come in the form of vinyl and are attached to the floor using adhesives. Take heed that if you intend to wash the garage floor with water, this seal will stop the water from flowing out, just as it stops the rainwater from flowing in. The next seal option is the Garage Door Stop Weather-stripping seal used on the sides of the garage door. These are usually made of rubber or vinyl and are installed onto the door jam. This seal comes in the form of a roll, and you apply its adhesive back to the door jam, the door-side flange of the seal must be pressed flush against the front face of the garage door to be effective. Another option is the Vinyl Door Stop with Integrated Weather-strip seal which is a perfect solution for rotten or damaged door stops. This molding is made of vinyl and comes with a hardwood like molding strip that is easy to cut with a saw. It is installed using steel siding nails. If you choose this option, then make sure you press it against the door stop in parallel to the door face. Attach the molding using the nails to the door jam. Start with the top molding and continue downwards. The last seal option is the V-shaped Garage Door Panel Weather-stripping seal, which is a special seal designed to close gaps between door panels. These are usually used on older wood doors where the wood has split between the panels. Modern metal doors come with overlapping components to combat this issue. These are budget-friendly options for limited time use and are great if you only intend to use the garage for short periods. This might seem daft, but it works, and if you have a budget issue and have a hot garage, open the doors during the daytime. If you live in a less secure area and are worried about theft and home invasion, then either secure the inner door with a powerful lock or don’t store anything in the garage apart from your car. Sorry for being so blunt, but this is the way it goes. One very useful method is to install portable electric fans that connect to the mains, or a solar panel source. There are a number of solar powered fans on the market that offer a perfect daytime cooling solution that only costs the purchase price, after this, you connect the fans, and they operate all the time there is solar power. Some portable fan units are killer cold when opened on full, and if you put a pan of ice in front of one, you get quite an interesting effect. For people that live in high humidity locations, adding a dehumidifier reduces the heat effect. It also makes it easier and more comfortable in general. However, for this, the doors have to be closed. So this is a perfect combo-solution when added to a cooling solution such as a fan or air conditioner. A swamp cooler is a millennia-old technology that was used in India 1,000 BC. Basically, this is the use of water and air, you create a waterfall and blow air across the water, which then converts the water into small particles that evaporate as they fly out, essentially cooling the air. You can add ice to the water to enhance the coolant effect. The only downside to this option is all that moisture that can affect the integrity of iron and wood, corroding them over time. The most expensive solution is to buy a portable A/C, there are many kinds to choose from, and all you need to do is make sure there is a hose for the water to flow through. Other than that, find a window or space you can “hang” you’re A/C onto and let her start to work. These are solutions for people that use the garage constantly and frequently. You might consider buying an overhead fan, maybe with a light too. These are great air mixing solutions, and they work well in all climates. Just find a convenient space in the center of the room, or in the location where you will most probably be situated when using the garage. The size range of ceiling fans is such that you can buy one big one for a large solution, or place two small ones on either side of the garage ceiling for a location focused solution. Installing a window AC unit might require you to make a hole in the wall, but that is a 1-hour job including smoothing the sides after completion and setting up a base. A/C is the best solution for truly cooling the garage, and while it’s the most expensive to buy and operate, it’s the overall comprehensive solution for all purposes. If your home has a central A/C unit, you might consider adding additional vents into the garage and this way it will become part of the home A/C and save you money on buying a new individual unit. One great solution is to add heat vents in the attic section, and if the attic is insulated this is perfect for reducing heat rapidly and constantly. Heat vents allow the hot air that rises to escape through the vents in the roof, and this creates a very slow flow of cool air and ventilates the garage 24/7. These are also great to have when using a fan or a swamp cooler. Maybe I should have started with this, but insulation is the first solution to work with. If you don’t have an insulated garage, insulate it all over, attic, walls and doors. This will significantly reduce overheating in the hottest of climates as well as protect the garage from freezing in the nights or winters. Whatever you decide to add, always add it after you insulate your garage. In fact, you will find that when you insulate the garage door, you significantly reduce the heat effect by a few degrees, and when combined with heat vents, provides an excellent cooling solution that is inexpensive and effective. The only “cheap” solution to insulate a garage door is to take the cheapest door insulation materials and use those to cover the door panels. There are many “cheap” solutions including used fiberglass rolls or batt that can be stuffed into paper bags and taped to the door. Alternatively, perhaps taking old plastic soda bottles, cutting them in half, gluing them together and then gluing them to the door with their cut side to the door, and the bottom inwards to the garage. Don’t use the tops. If you can, fill them with cotton wool. The bottom line is this, the moment I hear the word “cheap” states don’t bother, you can’t afford to go cheap. Insulating a garage door by yourself is not an issue at all, in fact, you don’t need any DIY skills per-se, just a measuring tape, a cutter of sorts and the panels. If you are not sure what to buy, then don’t buy a kit, just measure the door size in absolutes, and go to the local hardware store. Buy insulation sheets, and the store owner will help you, and make sure it has a high R rating; this means it’s more resistant to heat. When you get home, take the insulation sheets and lay them on the floor. Using the measuring tape, measure each frame in the door and then add half an inch to the dimensions. Cut out the panels to this size and then place them into the frames. You will need to apply some force and will hear a pop when the plate is in place. Don’t worry about the slight curve in the plate, that’s an air pocket and adds to the effectivity of the insulation. Make sure you have the following tools ready: A cutter or cutter, a measuring tape, a marking pen, and the panels or rolls of insulation. Also, make sure the door is clean, which means clean it down with alcohol wipes, so it’s sterile, and only apply the insulation when the door is 100% dry. The R-Value is how a measurement of how a surface area of material resists heat that is exposed to that surface area. The greater the R-value, the more heat resistant the material. This means you need to take the insulation value of the material and multiply it by the thickness of the material. The R-value scale is <1 to 50. What is the best garage door? There is no best; there is only the best solution specific for your requirements, where you live, the size you need and the risk factor conditions of the environment and what you use your garage for. When choosing a garage door there are a number of issues to consider, do you want it to be electric? Using a motor to operate the door, or manual? Do you want it to slide up, roll up, fold up, or perhaps slide sideways? Or open and close like a standard door. Do you want a smart door that comes with a remote and even IoT connectivity, or do you want a door that has a hinge, a handle, and a panel? As you can see, size does matter, since the larger the surface area, the stronger the materials needed to assure the doors integrity and constant performance. To better explain about the doors construction materials, let’s take a look at the five materials used in garage door construction. Wood was, is, and always will be the warmest, nicest and most beautiful material for building doors. The different wood types, the levels of detail and the variances provide garage owners with a wide range of options to choose from. Wood and wood composites are easy to machine and fabricate into any design and structure. They work well with metal components and are heavy and durable. The only downsides to wood are the weight to strength ratio when compared to metal and polymers, the fact that it is a fire hazard, and that as a natural material will damage when wet (even when treated). Steel doors, when designed properly, are the best solution for their hardness, toughness, and ability to withstand much damage over a long time. Steel doors come in some alloy options, ranging from plain steel sheets that are not good, since they rust quickly, to galvanized steel sheets or the expensive stainless steel sheets. The beauty of steel is that you can fabricate any door style using this material. The downside is their susceptibility to water corrosion and the weight of large chunks of steel. Aluminum is the preferred metal of most and is as popular as wood when it comes to garage doors. Aluminum is softer and lighter than steel but does not corrode like steel. As such, there are many roll-up doors made of aluminum. The downside is that aluminum is much more expensive than steel and it is, again, a softer material that is prone to dent even when a 3-year-old crashes into it with a tricycle. Fiberglass is a large but rigid option to both steel and aluminum, it is fire resistant, hard and rugged and is used in many marine applications (hulls). The material can be formed into any design and style, so garage doors can be molded into shape with fiberglass, something that metal and wood cannot do. (Except casting metals, but then you end up with a very expensive door). Vinyl doors are the new kids on the block and are much more resistant to damage than aluminum and fiberglass. They are easy to manufacture, the source of the material is cheaper than most but come in a limited number of color options. The bets doors are hybrids that use more than one material to optimize their weight performance ratio, that’s why steel and aluminum, or steel and vinyl doors are starting to make an impact on the market, Steel and wood to are also a common combination found these days. The best garage doors will include the necessary mechanics for opening easily and will be insulated to withstand heat and cold. Which material has the highest R-value? The comparison between door insulation is based on three factors: R-value, ease of installation and price, as such, here are a few comparisons for the some of the insulation options you can buy on the market today. Matador insulation is made from EPS foam sheets and has an R-value of R-4.8 value. This foam insulation kit comes with flexible ribbed sheets that are easily installed into the back channel of the door. Matador panels come with a bright white vinyl backer is easy to clean. Matador is a low R-value insulation and will not compete with any Fiberglass option since they are both priced similarly. The only difference is that EPS foam is safer and easier to apply than fiberglass. Guardian doesn’t have a garage door kit, but a lot of building insulation options. Their best and market leader in the unique FATT BATT® that can be used for garage insulation with an extra thick roll of fiberglass that can be applied anywhere. Owens Corning produces a standard flexible rolled BATT insulation kit with rolled fiberglass R-8 insulation sections and a fastening system that secures the insulation strips in place with retainer clips. Amvic uses a rigid insulation board made from Expanded Polystyrene (EPS) covered with a layer of polypropylene reflective lamination on both sides. This type of insulation has an R-value of only 5.00. The Matador insulation is made from EPS foam sheets and has an R-value of R-4.8 value. Both kits are low R-value kits and are very similar in performance, the extra 0.2 R-value on the Amvic is negligible.